Oxi Day, October 28th, is a national holiday in Greece. 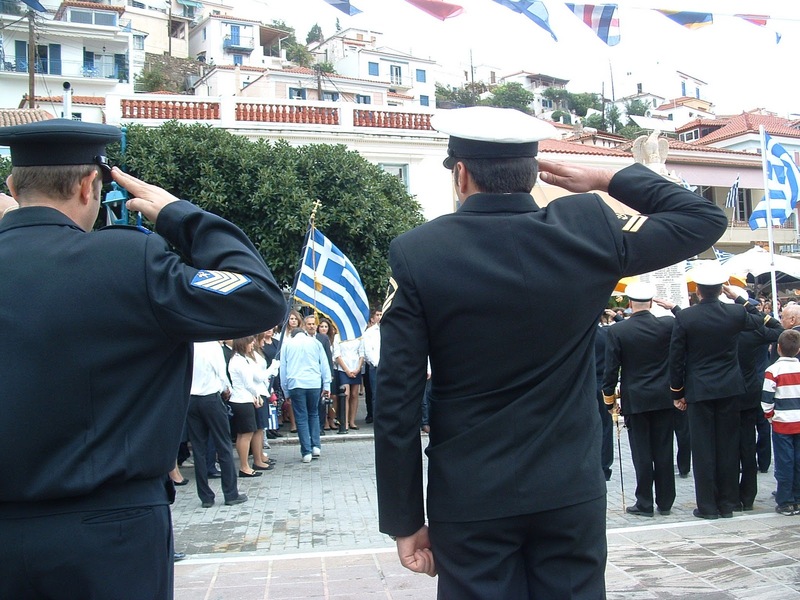 Throughout the country parades and celebrations are taking place and Poros is no exception. Today's chilly temperatures, dark clouds and wind didn't keep residents from lining our main street and attending the ceremony at the war memorial in the heart of town. Oxi Day commemorates the events that took place on Oct. 28,1940, when the Greek Prime Minister Ioannis Metaxes refused Benito Mussolini's demand to occupy certain portions of Greece that he considered strategic locations. The story goes that with a single word, "Oxi" ('oh-hee') or "No" the request was denied by the PM marking Greece's entry into the war. Today's celebration, a rather simple affair compared to the descriptions of those that take place in the larger cities, involved -- it appeared - every child on the island. School children marched wearing white shirts and dark pants and skirts; their teachers - men in suits and ties, and women in dress coats and shoes marched to their side. They were divided by grade with the youngest leading the parade. Each group drew loud applause from the on-lookers. A single, small uniformed marching band played. The Greek Orthodox priest opened the ceremony at the War Memorial with prayers. Pairs of school children, some wearing tradtional Greek clothing, placed wreaths at the war memorial. We all observed a moment of silence. Greek tourist guides say not to miss the observance festivities if you are in Greece - they are right. We consider ourselves fortunate to have been able to share in the celebration. On Foot or Burro? That is the question. Having one HAL of a cruise!